* Freestyle Riding - Over 1000 ridiculous tricks. * Real Mountains - Wide-open terrain with over 1500 jumps & rails. * Get Famous - Go big for photographers to climb the ranks. * Maximum Replayability: 100s of ways down the mountain. * 150 Indie Music Tracks - 10 CDs worth of music, or rip your own tracks. 01-27-2016 lugnut Box Text OWN THE MOUNTAIN * Freestyle Riding - Over 1000 ridiculous tricks. * Real Mountains - Wide-open terrain with over 1500 jumps & rails. * Get Famous - Go big for photographers to climb the ranks. * Maximum Replayability: 100s of ways down the mountain. * 150 Indie Music Tracks - 10 CDs worth of music, or rip your own tracks. 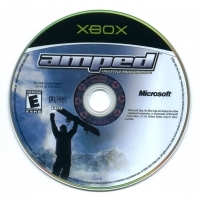 This is a list of VGCollect users who have Amped: Freestyle Snowboarding in their Collection. 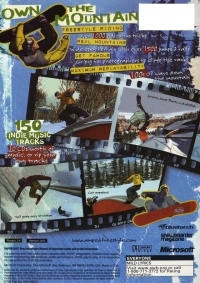 This is a list of VGCollect users who have Amped: Freestyle Snowboarding in their Sell List. 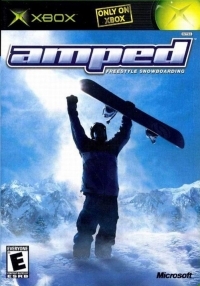 This is a list of VGCollect users who have Amped: Freestyle Snowboarding in their Wish List.